The KM62256C family is fabricated by SAMSUNGs advanced CMOS process technology. The family supports various operat- ing temperature ranges and has various package types for user flexibility of system design. The family also support low data retention voltage for battery back-up operation with low data retention current. By Samsung Semiconductor, Inc. 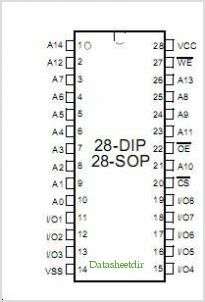 This is one package pinout of KM62256C,If you need more pinouts please download KM62256C's pdf datasheet. KM62256C circuits will be updated soon..., now you can download the pdf datasheet to check the circuits!